Unveiled on September 17th 1995. 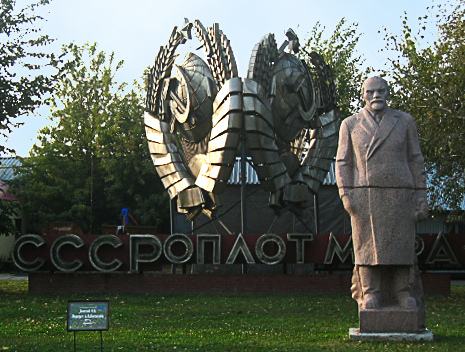 With the fall of the USSR, thousands of Soviet statues were destroyed or dispersed. Some ended up in Moscow’s Fallen Heroes Park. It displays more than 700 sculptures saved and preserved from the Soviet era. Walking through the park is like visiting a cemetery, bronze and stone sculptures loom from every corner. The park has mutilated busts of Stalin, as well as those of Lenin and a statue of Dzerzhinsky, the founder of what became the KGB. There’s a massive Soviet emblem, and clusters of modern art contrasting with the very non-conceptual Communist monuments. Further to my blog of 09.09.2017 – Centenary of a Revolution, my son Trevor informs me that Melbourne’s Heidelberg Gallery (The Heidi) has a Constructivist Display of artworks mainly from the Russian Revolution. No doubt many of the items on display would have come from Moscow’s Fallen Heroes Park. I have never felt a great emotional attachment to statues. 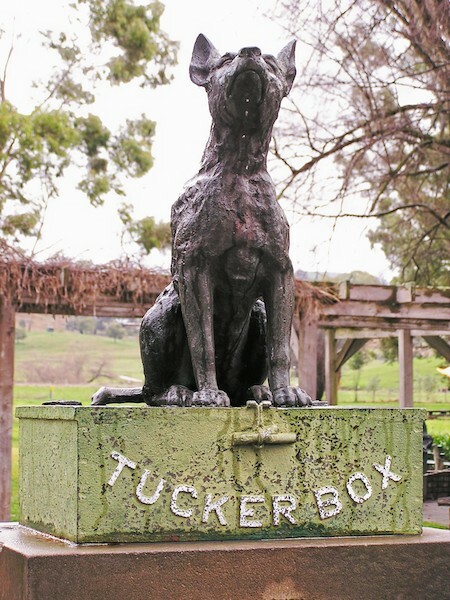 My first was probably the dog sitting on the tucker box five miles from Gundagai. For me, it always the highlight of our road trips to Melbourne. The other statue that has triggered my emotion was seeing Winston Churchill’s statue on a Paris footpath as our tour bus flashed past. It was so unexpected, considering the historic rivalry between the English and the French, but a touching acknowledgement of France’s gratitude for Churchill’s help during WWII. My father would comment that the shock waves from the explosions would lift “Torphins”, our beach house, momentarily off its high Queensland stumps and the windows would rattle, the iron bedsteads groan. There would be the loud, loud clatter of machine guns firing and sundry booms and cracks from high-powered rifles. “Another practice landing,” my Father might have thought and, as the noises subsided, have calmly pumped up the “primus” to boil water for a very early cup of tea. That was around 1944, during the Second World War in the Pacific. 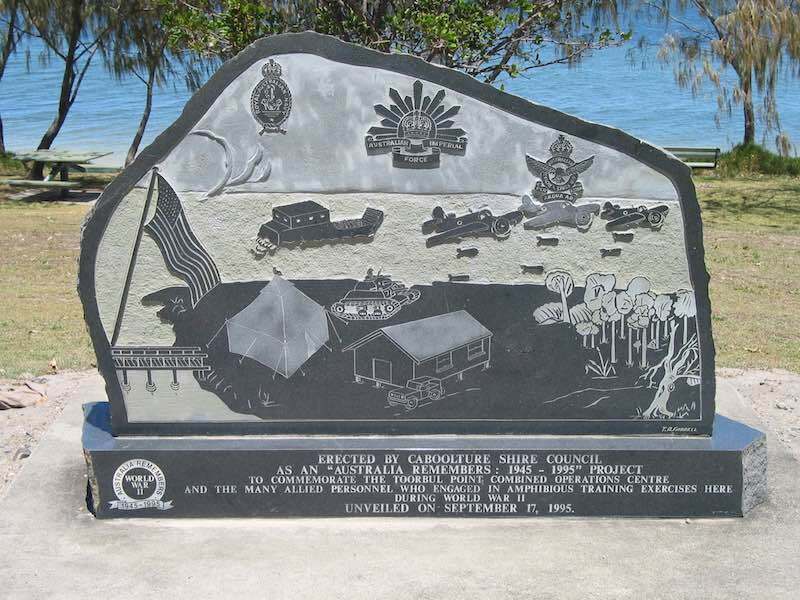 The American marines had a large training base at Torbul Point, on the coast of Moreton Bay. There, American troops practised amphibious barge landings. This was training for the island-hopping strategy to be used to retake the Pacific Islands then held by the Japanese. The sounds that shook “Torphins” were just rehearsals for what was to be real later in the Solomon Islands and, too, on Iwo Jima. So, barges filled with armed, invasion-ready marines would churn across the half-mile of Pumistone Passage, their bow-plates would be lowered and out the troops would storm onto the uninhabited northern part of Bribie Island with all guns truly firing. Then, Bribie Island had but few permanent residents and only land-owners with security passes could access the island. My family still went there for school holidays. The trial invasions were regarded as very necessary and quite accepted. On occasions troops would be moved around the island’s sandy tracks in trucks with the troops standing up on the tray behind. I have the distinct memory of a convoy passing our house and one of the troops falling off the truck. He picked himself up and ran alongside the truck to jump aboard again. I watched from the verandah of “Torphins”. Other items seemed to get left behind as well. Once, I found a well-balanced dagger. George, a retired circus rouseabout who acted as our caretaker when we were not on Bribie, taught me how to throw it. I have always regarded a dagger as my weapon of choice! For their ‘invasions’ the Yankie marines also took along food supplies. These came in wooden boxes, holding gold-coloured, squat tins on which, I think, was written two capitals letter ‘Ds’, with between them an arrow. I had found a full box of such rations close to “Torphins”. Do know that, for children (and I would have been eight in 1944) chocolate was a nearly unheard of dream. There was food rationing, but not for chocolate. Such sweetness had seemed to have ceased to exist. But I, with my find, had found a cache of chocolate! The wooden box’s tins had three different contents: some were K rations (which I believe implied emergency food) some contained baked beans and others hash, rather like Australian camp pie – not particularly tempting but I am sure with meat rationed, every tin was used by my family. 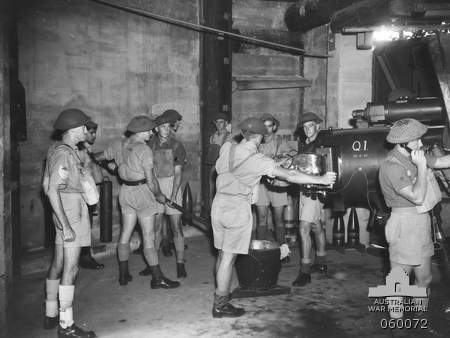 The K ration tins held chocolate, biscuits and some had cocoa, while some powdered coffee – unheard of in Australia then. The chocolate in each K rations tin was consumed with relish. However, the baked beans, heated up on the wood-fired stove, were mouth-wateringly delectable and are, to me, more remembered. Every-day, so-ordinary baked beans were then quite unobtainable until after the war had ended. Over seventy years later I still enjoy baked beans served on toast. Breakfast at a five-star hotel holds a special delight as one spoons a serve of baked beans from a highly-polished silver serving dish onto one’s plate. The memory of my first taste of baked beans comes back. And, for me, they are deserving of being served out of a silver dish. One box of army rations discovered must have made my cousins and I decide to search for more after another invasion trial not too far up from “Torphins”. There was Cousin George, Cousin June and I and it may have been the winter school holidays, in 1944. Our Grandmother must have been in charge. We were to keep to the beach – where we could be seen from the house for quite a distance. We found the invasion spot where the vegetation was trampled, some trees tattered. There we found another wooden box but this one was deeper and sturdier. It had been opened. It did not contain food tins. Instead, it held machine-gun bullets about six inches long and held into a long chain of metal. A disappointment, but we decided to take them home. With George leading, and the bullet chain looped between us, we ambled back along the beach to “Torphins”. Grandma saw what we were carrying. She was aghast. Grandma gathered up some oars, made us take the bullets down to the beach and help her push out our rowing boat into the Pumicestone Passage. Into the rowing boat she clambered, fitted in the oars and rowed out to what she thought was the channel. There she dumped our find of machine gun bullets overboard. I do wonder, would over seventy years be enough for them to have disintegrated? Cowan Cowan is a tiny settlement on the western side of Moreton Island a few kilometres north of Tangalooma. 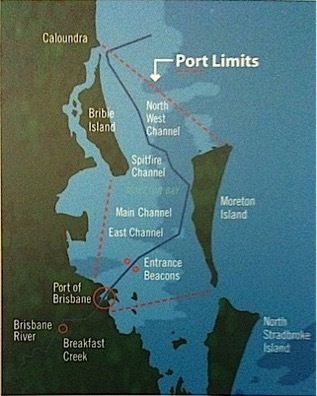 On this map, it is situated just where the main shipping channel almost touches Moreton Island. In the early days, when a ship entered Moreton Bay, a pilot vessel would be dispatched to guide it safely into port. In 1848 because of its proximity to the shipping channel, the Pilot Station was moved from Amity to Cowan Cowan on Moreton where, by 1860, it was recorded as having in residence two pilots, nine boatmen, and others, all living in wretched conditions. Later the Pilot Station was shifted still further north on Moreton to Bulwer. 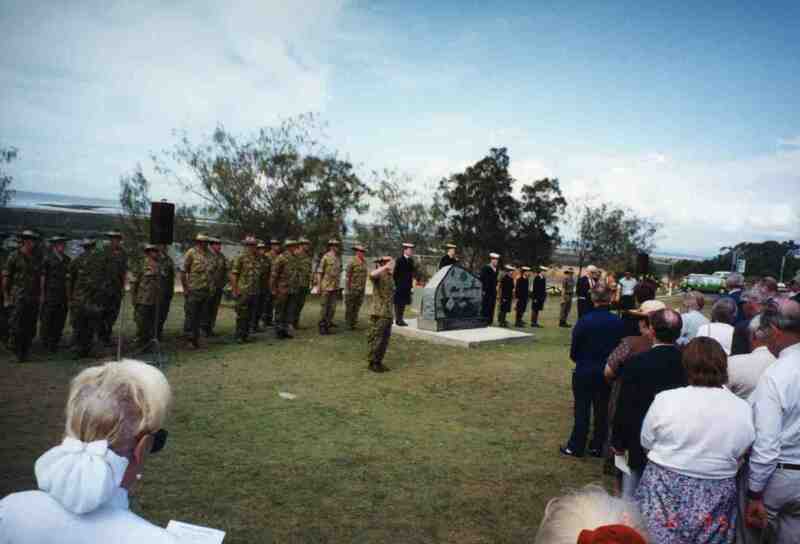 At the commencement of WWII, there were three Forts built to protect the entrances to Moreton Bay. The main shipping channel, via the North West Channel between Bribie and Moreton Islands, was guarded by Fort Bribie, a garrison situated on the northern end of the island where the channel passes closest to the beach, and by a similar Fort at Cowan Cowan where the channel passes closest to Moreton Island. Fort Rous, on the southern end of Moreton Island guarded the bay from any shipping attempting to enter via the South Passage. At each of these Forts was a pair of six inch guns. Bribie was sea firing, Rous was sea and bay firing, while Cowan was bay firing only because the height of Mount Tempest proved too large an angle for the guns to fire over to sea. ‘In 1939 when war was imminent, I was sent with the Engineers over to Cowan Cowan to build facilities for a garrison to be stationed there. We firstly cut our own timber to build a bridge over the swamp behind Cowan, then constructed a rifle range where the land begins to rise to Mount Tempest. I’ll bet it’s still there today because we made it out of ironbark. It was backbreaking work shovelling sand. ‘Next we sank a well on the Cowan side of the swamp. Up until then we depended for our fresh water on supplies brought down on the “Grazier”. Washing was done in the bay with the sharks! Then we constructed wooden towers to hold the corrugated iron tanks for the water, then ablution blocks for the showers. We then cut stumps and had them sunk and levelled ready for pre-cut huts brought down on the “Grazier”.